Late fall, Steve Jobs sadly moved on from this world. He's gone and missed. Yet, a photo of Jobs in the back of a truck is now making the internet rounds in China. Could this be the information age's equivalent of Elvis sightings? The photo was apparently taken on September 26 in the city of Xi'an. 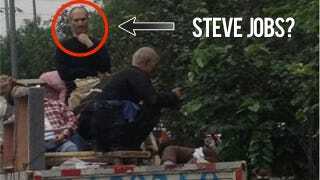 A figure that looks like Jobs, complete with his iconic pose and black sweater, is visible in the back of a flatbed. Online in China, the photo has caused a flurry of responses. "Jobs has resurrected," wrote one net user. "Please do something about the iOS maps," wrote another. There are not many details about the actual photo, and it could be clever Photoshop (like this), another wax figure, or maybe, just maybe, Steve Jobs has returned to, you know, fix iOS6 maps. They're so awful! Update: As VR-Zone (via reader Orionsangel) points out, the Jobs riding the truck looks like another wax statue (not the Madame Tussauds one) spotted in China. Maybe it can fix the iOS maps... Sure couldn't make 'em worse.